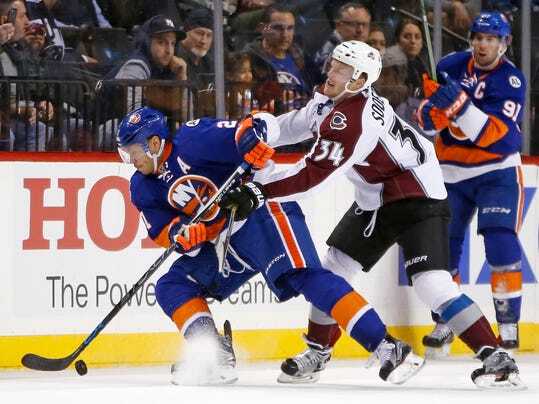 NEW YORK (AP) — Cal Clutterbuck broke a tie 1:52 into the third period and the New York Islanders beat the Colorado Avalanche 5-3 on Monday night. Off a faceoff win, Clutterbuck redirected Thomas Hickey’s point shot past goalie Semyon Varlamov’s glove. The goal was Clutterbuck’s sixth of the season and the first of two third-period goals from the Isles’ fourth line. With Varlamov on the bench, Holden cut the Islanders’ lead to 4-3 with 3:34 left, but Strome scored an empty-net goal with 47.9 seconds left. The Avalanche nearly scored off the opening faceoff, but Greiss robbed Matt Duchene with a left-pad save.